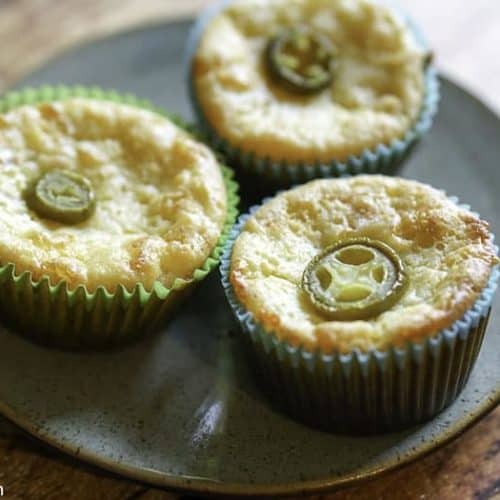 These Cheesy Jalapeno Cornbread muffins are the perfect bread to serve. Slightly sweet, some heat, makes them the perfect dish to serve. Cornbread doesn’t need to be boring you can make cornbread even better when you add a few ingredients to it. 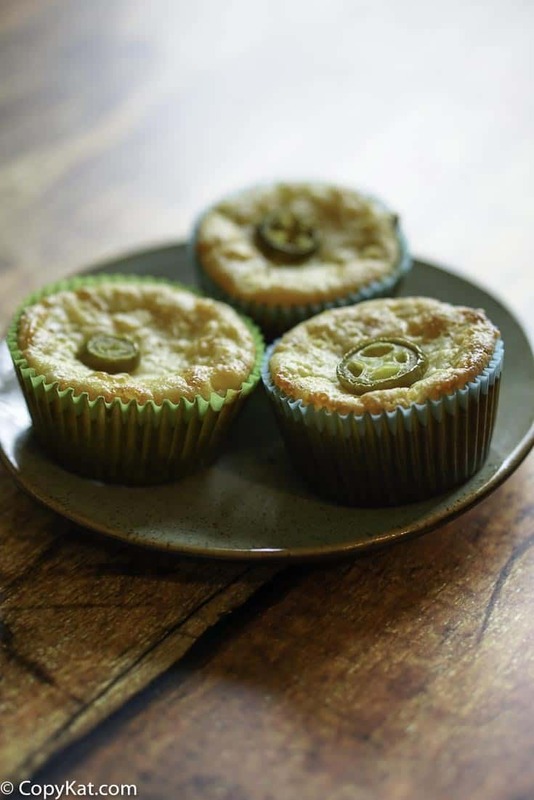 This cheesy Jalapeno cornbread can be made into a large pan, or muffins for individual sizes. It’s completely up to you. What do I love most about this particular recipe? The way the Cheddar cheese browns perfectly on top of these muffins. What makes this cornbread special? All of the mixins! To this recipe, we are adding creamed corn, lots of Cheddar cheese, sour cream, and some pickled jalapeno peppers. I do have to say that a can of green chilies also works very well. When you use pickled jalapeno peppers you are using peppers that aren’t too hot. These peppers are much milder than the fresh ones, so if you have family members that can’t take a lot of heat, this is the perfect recipe for them. This Cheesy Jalapeno cornbread is perfect for when you have a large crowd. It makes 24 regular sized muffins. With a little batter left over, I got another 12 mini muffins as well. This recipe contains a lot of cheese, So be sure to spray plenty of non-stick spray into your pan, or you may want o use paper liners to keep cleanup to a minimum. Either way, you make this, I know you are going to love this cheesy, perfectly spiced cornbread. 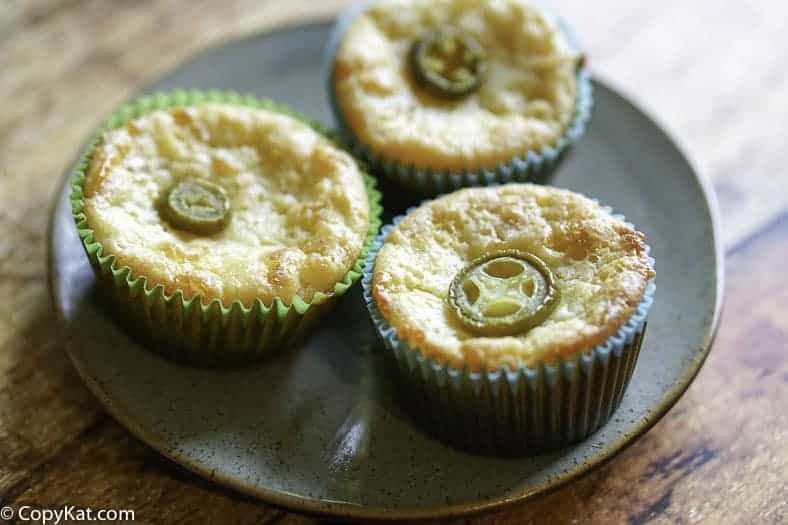 These Cheesy Jalapeno Cornbread Muffins are full of flavor. Preheat oven to 350 degrees. Blend all ingredients together until smooth, about 3-4 minutes. Fill baking cups 3/4 full and bake in a preheated oven about 20 minutes until done. Check for doneness with a toothpick inserted into top of muffin, if the toothpick comes out clean the muffin is done. Store muffins if there are any left in an airtight container. I use the extra large cups and this will make about 9. We just love to get recipes from our readers. This Jalapeno Cornbread is wonderful. We tried this out at a recent potluck. It was a smash! Thanks to Norma for this recipe. These were great. I really enjoyed them!